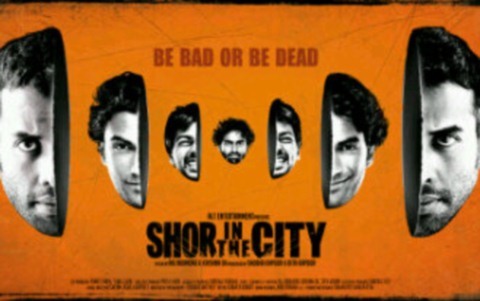 Movie Review: Shor In The City | Mehta Kya Kehta? Okay, here’s the thing: Shaky camerawork is highly capable of sucking the fun out of my movie enjoyment. Even if the film happens to be very good, even if the camera is being shaken by my favourite director – I don’t like it. And especially when two-three people are talking to each other, I like the camera to stay still, because the shaking strains my eyes and doesn’t make the scene more intense or interesting. Shor In The City is a quirky little film, can’t say I’m surprised because half the world has been after me to watch it. Spread over the 10-day celebration of Ganesh Chaturthi (Sanket D. Jariwala will rush to see the film now), Shor In The City tells three stories and makes a connection between them. A phoren-return dude (Sendhil Ramamurthy) sets up a small business in Mumbai, gets intimate with Preeti Desai, is subtly threatened by extortionists and has to cough up “protection money”. The third story is about a guy trying to get into the local cricket team, the primary reason being he needs to have something concrete to show his pretty girlfriend’s family in order to marry her – and he must pay the selector a bribe of 10 lakh rupees to make his way in. The film moves on to incorporate events and occurrences in each of the tales which causes many of the characters to have epiphanies, and under the eye of Ganpati bappa (smirk all you want, Sanket), Shor In The City delivers the triumph of good over bad, by way of making the good turn bad-der. Shor In The City is a one-time watch that has oodles of humour and sensitivity… and justice for all. You should go for this hatke film and I should catch the filmmakers’ earlier work 99.
ok. and why do we have a semi clad womans photos at the bottom of the review?. Because she’s in the movie! That’s Preeti Desai! Who’d read the review if I put her next to the text? Haan, it’s a timepass flick… I don’t know why the other reviewers are jumping up and down. she’s nice. I MEAN REALLY REALLY NICE. what crap!….i read somewhere in one of the actor’s interviews that Preeti’s scene was smoking!…..bastards! The directors duo’s earlier flick 99 was diferent and good too. I appreciate that they try to tell a different tale atleast with a good helping of commercial aspect to it. Nahi karaygay toh producer khada nahi kartay next time..i know, i am in the same industry. and shaky camera work has to be delivered according to the film and the flow and its a technically challenging job which DOP’s outside are masters at. Do watch Belgian flick EX-DRUMMER (entire film is shaky cam but it doesnt bug u, infact it enhances the feel of the film) also spanish flick which is more commonly seen by people AMEROS PERROS has 90% shaky cam in it shot on 16 MM super film which gives it that grainy look. the point is they do these things for a reason not just to make it look cool like folks in India.